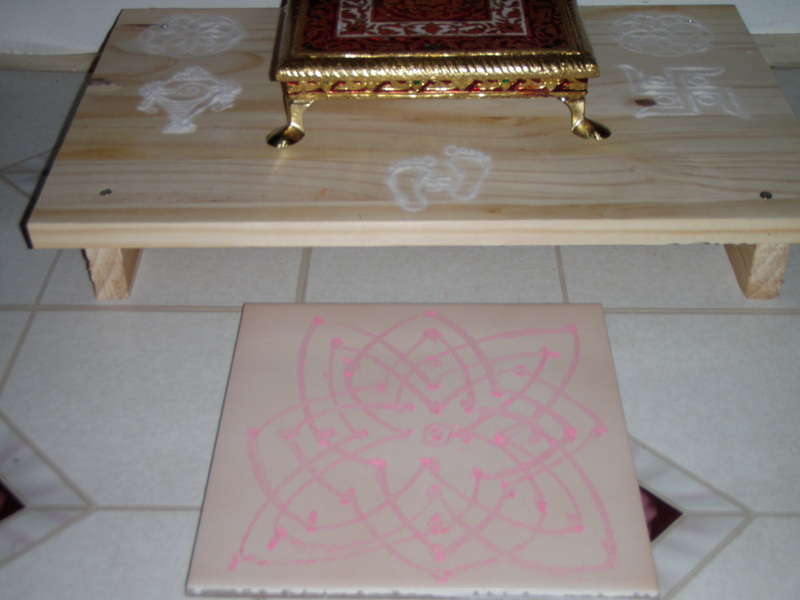 Rangoli designs for the Pooja, with Lakshmi Hrudaya. 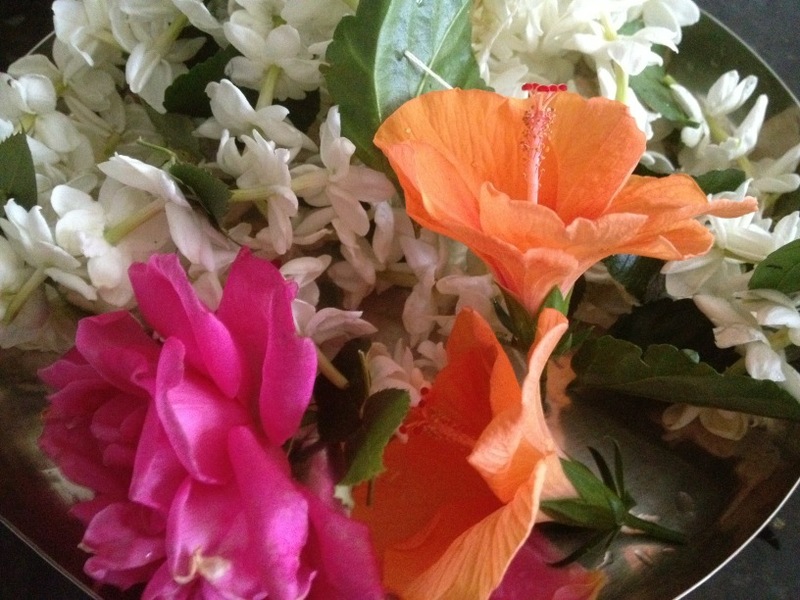 A picture of jasmine garland made from flowers in my own garden for Lakshmi Pooja. After, Naivedya, Mangalaruthi, and Laskhmi Aarathi. I have scanned and attached a document which has the complete details on performing Sri Lakshmi Pooja during Fridays and also Shravana Masa. This shouldn’t be confused for Sri VaraMahaLakshmi Vrata. I will post a separate post providing all details for Sri VaraMahaLakshmi Vrata. This document has all the details from doing the Achamana, to Sankalpa, Dhyana, Naivedya, and Maha Mangalarathi. It is a PDF document and is in Kannada. Attached below are other links posted here on Goddess Lakshmi. Attached below are some other links where many more posts have been added on Lyrics and Goddess Lakshmi. P.S: It is very difficult to translate these in English, so I am not doing that. If you have any book and want to share, scan it and send it to me. It is a wonderful website. Thank you for all the content. I am using your website as a guideline for every Pooja. All your authentic Madhwa recipes are amazing. Keep it going! Hello mam ,thank you so much for the information , i have been searching a lot for the pooja vidhana in madhwa paddati .. it helped me lot hope you attach more n more information about our traditional information . Smitha, I don’t have anything scanned. All links are in the post. Madam, Plz send me this song if you have. Chavari raguti nakida chalavi bandale. Shivana yettikondu aake naguta bandale !!1!! Mandagamaniyaru aaruti tandu belagire !!2!! Please give the list of articles required for marriages in madhwa tradition. Please also give the list of things to be observed from Nichitartha to the end of the marriage. Please send me a reply to my gmail address. I would like to know that, if once we do pooja of shravan shukravara and shanivara and also jyesta gowri vrata. we can do the Gaja Gowri vrata at home because some body informed that if we do shravan gowri vrata we must not keep the gaja gowri and do the pooja at home. I have no idea, Ramesh. 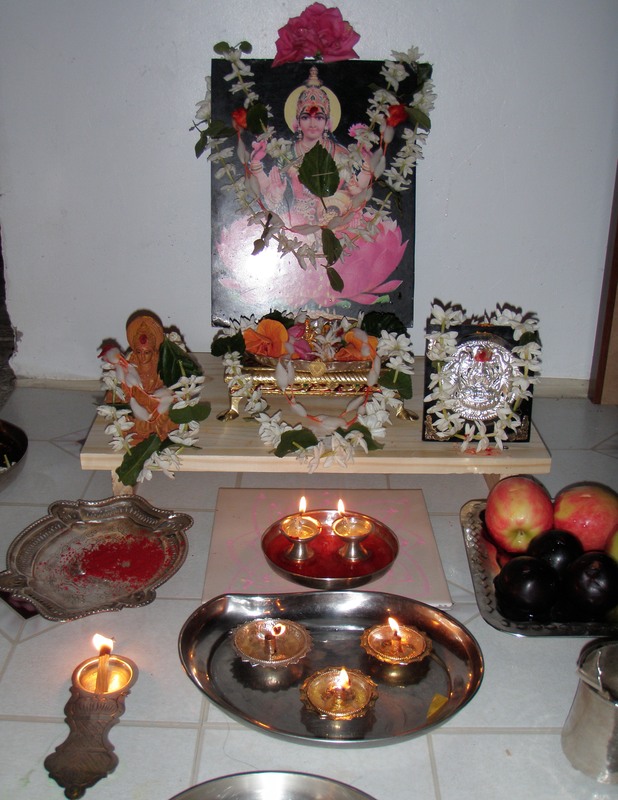 Goddess Lakshmi to our husband and our family. 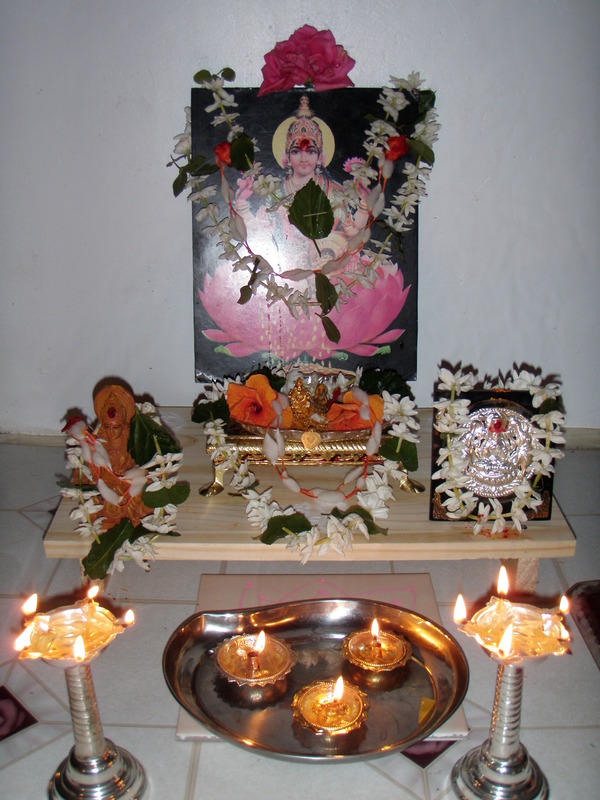 And Every friday I am used to perform Lakshmi Pooja at home by chanting Lakshmi Ashtothiram and other songs. Thank you for having made me to see this post to-day. Your web site is really wonderful and very informative. Thanks. By the way please tell me as to how many cotton beads should be there for Lakshmi Gajje Vastra and while doing the Gajje Vastra grand mothers recite the names of the Lord. If you know that (or please can u check with ur mom for the names) please let me know. Thanks for your comment. It is 16. I will check with my Mom about what names are recited. Thanks a lot Meera and awaiting for your valuable reply!!!!! it is filled with rice, no water. Lot of information in your blog. Thanks for the good work. Pls. do share decorating mora for gowri bagina. I came across your blog today, just amazing! You have so much of useful information, great job, Meera, all the best! Yes, I will try that and post. Hi I have the Sampat Shukravarda haadu as well as Sampat Shanivard haadu in Marathi which is as good as a Hindi writing. Will that be helpful? I can try to scan all the pages and upload. These are by great poetess Bhimavva. I have sent you an email. Please send the PDF there. Hi, I have sent you the above songs PDF files in reply to your email from last year, but looks like you have not received them yet. Maybe spam folder is a good idea to check. Also, sorry for not sending them last year. Namaskaragalu, Nanage laskshi haadu DEVI BANDALE SHRI DEVI BANDALE, CHAVARI RAGUTI HAAKIDA CHELUVE BANDALE bekaagide. Dayamadi tilisi. dayavittu pitrupaksha andare sattavarige pooje maduvudara bagge tilisi. We are performing the same at our place since my Mother-in-law expired just 2 months back. However, it is really complicated and so I am not really comfortable writing about that. I am a big fan of your website. I go thru regularly all your postings. Please let me knowt he procedure for 5th year Mangala Gowri Puja, Udhyapane and bagina to be given to one’s mother in the 5th year. As next tuesday 23rd aug is fast approaching, I wld appreciate if the info is given at the earliest. can u please attach the lakshmi puji vidhi in english traslation…..it will be helpfull to non kannadige people……!!! I am not sure how to translate certain words in English, and so didn’t post the details here. I tried but failed, Arthi.